STALKER: Call Of Pripyat Review: Third Time's A Charm? STALKER: Call of Pripyat is the third game in the first-person shooter STALKER series, but seeing as it's also meant to fix its predecessors many, glaring failures, it's also a first. Again set in a near-future world centred around the Chernobyl exclusion zone, Call of Pripyat is supposed to be more focused, and more importantly stable, than the horrendously "loose" Shadow of Chernobyl or Clear Sky. Whether STALKER: Call Of Pripyat manages this or not will, for most people (STALKER fans aside), be the deal-breaker. Concentrate... Concentrate... Call of Pripyat benefits from a reduced vision and tightened design. Its quality over quantity, tedious, empty wastelands replaced in this game with more points of interest and a more dynamic look and feel to the world. It also features some excellent "linear" sequences, similar to a more restrained shooter, especially one late in the game that sees you slogging your way through some well-designed tunnel sequences. Alive: CoP feels like more of a natural game world than its predecessors. Instead of only finding other characters hanging around select areas, you'll run into a lot more of them out in the wilderness. You're more likely to run into a STALKER in the middle of nowhere for a chat, other times you'll spy a band on the horizon being mauled alive by mutants. These little touches do a lot to break up the artificial feeling of emptiness that lingers in other STALKER titles. Cheeky Dwarf: CoP features telekinetic dwarves, which not only throw things at you, but can steal your weapons as well. Telekinetic dwarves. Brilliant. Sounds Great:While the voice-work in STALKER: Call Of Pripyat isn't the greatest (see below), the music and sound effects are. The eerie, incidental stuff in the background is good enough, but some of the weather effects, like a howling wind or the crack of thunder, are great. If It Ain't Workin, Fix It: So I get my copy of the game. I install, boot it up, and within three minutes, I get my first blue screen of death, the first I've ever received on my current PC. Second time I boot it up, I get it again. Third time I get a little further, maybe 20 minutes in, but this is punctuated by temporary freezes. Then the game freezes for good, and I'm again reaching for the reset button. The longest I got in the game without a freeze or crash was around 45 minutes. Rough Around All Edges: You know things are bad on the trimmings side when the intro's voice-over and its subtitles don't match. The narrator (or is it the writer?) even gets crucial dates wrong. This continues through into poor writing, a poor storyline and terrible dialogue between characters. I know, these guys don't speak English as a first language, but some better localisation wouldn't have gone astray. Age Shall Weary Them: The first STALKER looked... OK. In 2007. 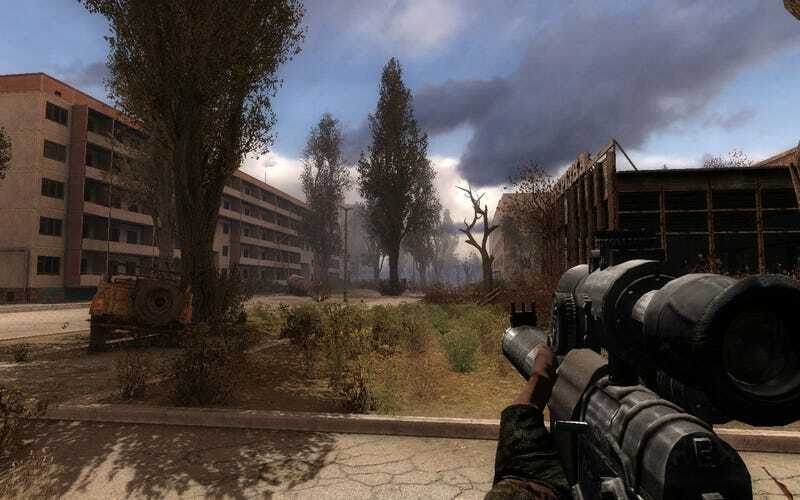 In 2010, Call of Pripyat looks terrible, even its highest graphical settings doing little to mask the fact this is an engine well past its prime. It's not all bad - some lighting and weather effects are nice - but everything else, from trees to grass to enemies and characters, don't look so hot. Note, however, I wasn't running DX11 in an attempt to just get the game to work. That might improve things a bit. Oh, That's It? Almost the entire game is spent building you up towards reaching the town of Pripyat itself. Think Half-Life 2's citadel. It's always visible in the distance, it's what you're working towards, it's the centre of intrigue. Yet when you eventually get there, after probably the game's strongest sequence, you find it's...well, it's a run-down urban area. Like any other run-down urban area in the game. What a let down. Look, fans of STALKER's particular brand of open-world misery will probably find this the best game in the series, as it's a refined, improved product. It's the STALKER they - and everyone else - probably thought they'd be getting in 2007. But that's just the thing. It's now 2010, and even in an improved state, Call of Pripyat is still too rough and too raw to recommend to anyone other than experienced STALKER fans. STALKER: Call Of Pripyat was developed by GSC Game World, released on the PC on February 2. Retails for $40 USD. A copy of the game was given to us by the publisher for reviewing purposes. Played single-player game to completion, and 5-6 multiplayer matches.